Yesterday was the birthday of Moran Lee Boggs, better known as Dock Boggs, was botn in Norton Virginia on Feb. 7, 1898. Yesterday also was the anniversary of the death of Dock Boggs. He died in 1971 in Needmore, Virginia, about four miles from Norton. Oh Death! You sure know how to ruin a birthday party. Of all the early hillbilly singers, the banjo-picking Boggs was spookiest. His thin, terse tenor seemed to embody hard times and hard living. 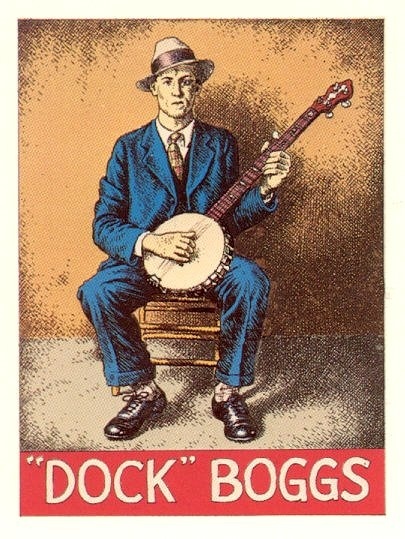 Dock Boggs was born in Norton in 1898. For most of his life he worked the coal mines in the area, save for time as a moonshiner in the ’20s and as a professional musician between 1927 and 1929, when he recorded twelve sides for the Brunswick and Lonesome Ace labels. In 1963, at the height of the folk-music revival, he was rediscovered, right where he’d always been, and went on to record three albums and play festivals and concerts around the country. He died in Norton in 1971. He was—as Thomas Hart Benton had recognized from the first, pressing Boggs’s version of the old ballad “Pretty Polly” on anyone who would listen to it—pos­sessed of one of the most distinctive and uncanny voices the American language has ever produced. On Boggs’s 1927 “Country Blues” a wastrel faces ordinary, everyday doom. The banjo, which as a white man Boggs plays like a blues guitar, presses a queer sort of fatalism: fate in a hurry. At the close (“When I am dead and buried/My pale face turned to the sun”—Boggs worms you into the old, common lines until you sense the strange racial transformation they hint at), the singing rises and falls, jumps and plummets in a rush, as if to say, Get it over with. In 1963 Boggs recorded “Oh Death”—“Won’t you spare me over for another year?”—and you can imagine Death’s reply, which would have been as fitting thirty-six years be­fore. Sure thing, man, what the hell. It’s no skin off my back. You sound like you’re already dead. Here's "Oh Death," recorded in the 1960s when Boggs was getting older. It's starker, far less melodic, and, true to Marcus, more dead than the Ralph Stanley that everyone knows from O, Brother Where Art Thou? ... in its English versions Polly’s pregnancy is part of the story. In Boggs’s version there is ... no mention of it — but there is something more, or anyway something else. The evil in his singing, a psychotic momentum that goes beyond any plain need to do-this-to-achieve-that, overwhelms the song’s musicological history. As Boggs sings, the event is happening for the first time and the last. One of Boggs' best known songs is "Sugar Baby." But it's not very sweet. It sounds like it's coming from a guy who truly hates his wife. The song has a similar line as one in "Pay Day," a Mississippi John Hurt song, also from the late 1920s. But when Hurt sings, "I've done all I can do and can't get along with you/ Gonna take you to your mama pay day," he sounds sweet, if sad. But when Boggs sings, "I'll send it to your mama next payday," a listener just hopes the woman does make it back to her mama. And when he sings, , "I'll rock the cradle when you gone," you hope he doesn't murder the baby too. If this music is just too intense for you, calm your nerves with a good stiff belt of rub alacohol. Bottoms up and happy belated birthday, Dock!